Rilasciate le immagini ufficiali dela set LEGO Marvel 76060 – Doctor Strange’s Sanctum Sanctorum, in arrivo nell’estate 2016 insieme alle altre novità della serie Super Heroes. Il set è composto da 358 pezzi per un costo di $29.99. Stai cercando News LEGO sui prossimi set in uscita nell’estate 2016? LEGO Volkswagen Beetle: le immagini ufficiali dell’atteso set Creator 10252! Stage a face-off against the portal beast in Doctor Strange’s Sanctum Sanctorum, with levitating function levers and mystical artifacts. Includes 3 minifigures. Banish the portal beast from Doctor Strange’s Sanctum Sanctorum! Team up and expel the portal beast from Doctor Strange’s mysterious headquarters with some super-heroic supernatural action! Fend it off with Doctor Strange’s mystical artifacts, and evade being captured by the portal beast’s tentacles using the cape of levitation. Send in Karl Mordo to battle the beast with his quarterstaff, and help The Ancient One strike with the powerful magical fans at her fingertips! 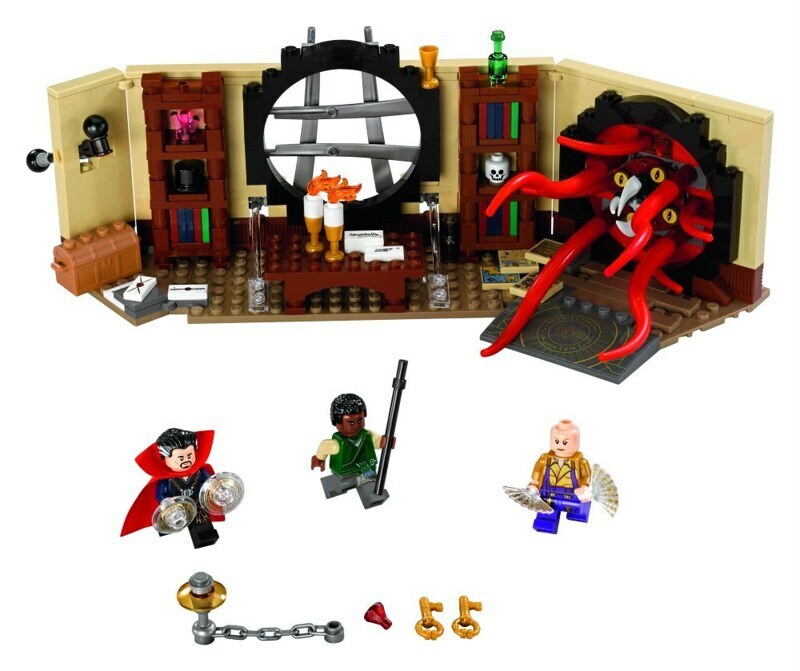 Doctor Strange’s Sanctum Sanctorum features a portal beast with rotating teeth, moving eyes and tentacles that can trap minifigures, shelves for mystical artifact accessories, levitation effect for 2 minifigures, and levitation function for Doctor Strange’s cloak. Weapons include Karl Mordo’s quarterstaff and The Ancient One’s magical fans with eldritch calligraphy. Accessory elements include Doctor Strange’s cloak of levitation and magical power elements with eldritch calligraphy markings. Sanctum Sanctorum measures over 4” (11cm) high, 12” (31cm) wide and 7” (18cm) deep. Next LEGO Planet Express Ship: il ritorno di Futurama in versione UCS!